Your garage door serves multiple functions. It’s a huge portion of the front of your home’s look, it allows you to come in and out according to your busy schedule, and it protects the belongings stored inside as well as an entrance into your home. This is why it’s so important to ensure that it’s working as well as it should! Your door must be reliable and close and open when you need it to, so if it’s not, it’s time to give our technicians a call! Inside the track that your garage door slides along are the rollers that help it to do so. Unfortunately, over time, these rollers can get rusty or even broken, which can cause your door to slow down and struggle more with opening and closing. That’s where we can assist you! We’ll inspect the rollers to see if they can be repaired or need to be switched out and get it all done before you know it. Are Your Panels Looking Shabby? Whether a small bump from the car caused a dent, or a storm made one of them crack, our experts will be able to get it looking like nothing ever happened! If it’s a small amount of damage we’ll be able to simply repair the problem, but don’t worry if it’s something bigger! We can find the perfect size and color of panel to replace it with for you, no problem. The springs of your garage door are connected to the weight of the door itself, so it’s in your best to allow professionals to take care of them! We can get a broken spring replaced, be it extension or tension, and have your door working smoothly again quickly. 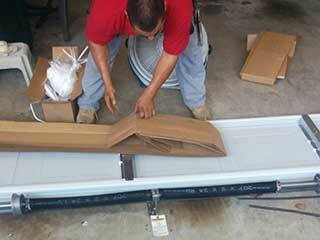 Call Garage Door Repair Redlands now and we’ll get your door like new again in a flash! You’ll only regret not calling us sooner.